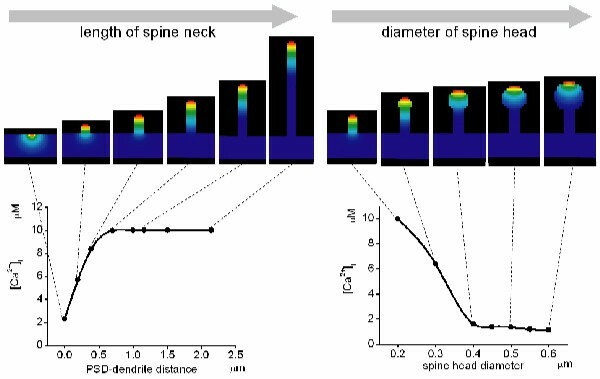 Can calcium ion contribute to morphological plasticity of a spine? Structural plasticity of a spine, which is a change in the spine morphology with synaptic stimulation, has been reported from several labs. Structural plasticity is thought to be a consequence of the induction of long-term potentiation. Some reports suggested the role of actin molecules in the structural plasticity, and the change in F-actin structure will play a pivotal role in the morphological change of a spine [1–4]. The structure of F-actin is controlled by complex mechanisms, and the molecular mechanisms which contribute to morphological plasticity of a spine are not understood yet. Here, we performed several simulations to see whether the intracellular calcium ion can trigger the structural plasticity of a spine. Simulation results have shown calcium could be a molecule triggering the morphological change of a spine. From these simulation results, we propose a hypothetical mechanism involved in the structural plasticity. Morphological models including mushroom spines and filopodium with different size in head and neck diameter were constructed using A-Cell software [5, 6]. The 3D morphology was compartmentalized, and Ca2+ entry through NMDA receptors and medium- and low-affinity Ca2+ buffers were embedded to corresponding compartments. Ca2+ diffusion within a spine or filopodum was calculated using Fick's equation. Figure 1 shows the overall reaction schemes and the model morphology. Overall reaction scheme (a) and morphologies used in simulations (b). First we simulated the change in the concentration of intracellular calcium ion ([Ca2+]i) in filopodia. The peak [Ca2+]i was increased as the length of filopodium was increased as was expected (Fig. 2 left). However, it was saturated at the filopodium length longer than 1 μm and kept almost the same level. Next, the diameter of a spine head was changed with fixed length of spine neck. With the increase in the spine head diameter, the peak [Ca2+]i was decreased as was expected (Fig. 2 right). However, [Ca2+]i reached a minimum and it kept almost the same level even if the diameter was increased further. The change in [Ca2+]i by the change in the size of filopodium (left) and a spine (right). The present simulation results have shown the change in [Ca2+]i with a change in the size of a filopodium and a spine. This suggests that [Ca2+]i can be a triggering molecule for the structural plasticity. The hypothetical mechanism is shown in Figure 3. First, calcium concentration in a localized region of a dendrite is increased forming a 'hot spot'. Second, actin polymerization begins at the 'hot spot' and the protrusion develops increasing the peak [Ca2+]i at its tip. Third, this increase in [Ca2+]i results in further actin polymerization and its bundling. Fourth, protrusion develops further and the peak [Ca2+]i increased. At some level of [Ca2+]i (threshold level), the actin structure at the tip of filopodium is changed from bundling to a meshwork forming a spine head. Hypothetical mechanism triggering morphological plasticity.